Akunyili Crosby is the second artist to create an outdoor mural (on view until the end of February 2019) designed specifically to wrap the exterior of MOCA Grand Avenue, a new initiative that invites views both by pedestrians and through the windows of moving cars on Grand Avenue. Njideka Akunyili Crosby is known for deftly combining collage, printmaking, drawing and painting in sumptuous and cinematic large-scale works. Fusing Nigerian and American source materials, histories and cultural references her works typically show members of Akunyili Crosby ‘s family in modern domestic interiors in a palette of subdued pastel hues, rife with printed fabrics and vibrant greenery. Born and raised in Nigeria and now living in Los Angeles, Akunyili Crosby constructs intricately layered scenes reflecting the rich complexity of contemporary lives shaped by postcolonial African cosmopolitanism and global, hybrid identities. 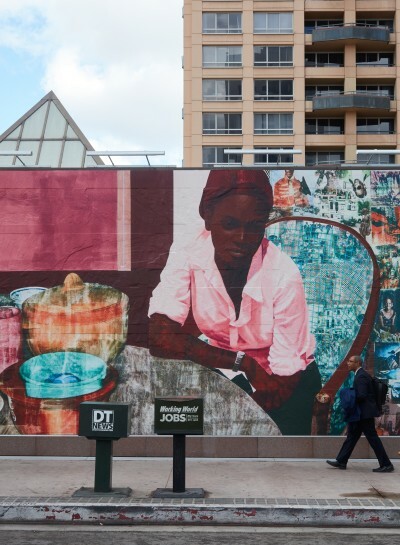 Akunyili Crosby is the second artist to create an outdoor mural designed specifically to wrap the exterior of MOCA Grand Avenue, a new initiative that invites views both by pedestrians and through the windows of moving cars on Grand Avenue. Her work transforms the museum itself into a canvas for explorations of scale, texture, pattern, intimacy and a multiplicity of perspectives.